HAMPTON, VA. April 4, 2019 — Hampton University will recognize the generosity of Hampton University alumnus and Board of Trustee member, Mr. James T. George (’58) with the dedication and naming ceremony of the James T. George School of Business, April 4, at 4:00 p.m. inside the Ethel C. Buckman Hall Rotunda. George earned a Bachelor of Science degree in Biology from Hampton University, where he was also commissioned a Second Lieutenant in the United States Army. George went on to be one of the first African-Americans to receive an MBA from the University of Arizona. He also holds an Advanced Management Certificate from Pennsylvania State University. He is a graduate of the Armed Forces Staff College in Norfolk, VA and the Army War College in Carlisle, PA.
George founded MSTI, a small business, in 1990 after serving for 27 years as an active duty Army officer. Retiring as a Colonel, he served in a variety of infantry and comptroller positions both overseas and in the United States, including two tours in Vietnam and tours in Korea and Europe. As Assistant Comptroller of the Army for Financial Planning at the Pentagon, he led the development of the initial concept for an information system to integrate the Army's programming and budgeting process. He concurrently served as a member of the board of directors of the Army and Air Force Exchange Service (AAFES) for three years while serving as comptroller of Fort Devens, MA and subsequently, while at the Pentagon. 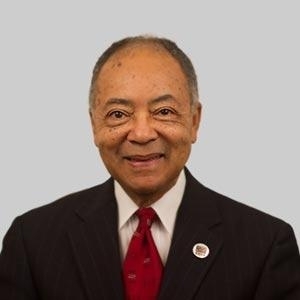 He currently serves on the Board of Trustees of Hampton University. MSTI was established as a management consulting company. Its current focus is information technology solutions and management solutions. The company has grown from one person to its present strength of approximately 300 employees. Mr. George continues in the role as chairman, but has now relinquished day-to-day operations to the present CEO, Mr. Norris Middleton, who is also a Hampton alumnus. George and his wife, Juliette, a retired Fairfax County secondary school teacher, have been married for over 50 years and have two children and two grandchildren. They currently reside in Fairfax Station, VA.